I found this good-condition softcover at a local thrift shop, and nabbed it for another release copy. This volume opens with Natsume rescuing a tiny yokai from crows. It's a very cute little fuzzball - with tiny, possibly poisonous fangs! - but it seems grateful when Nastume returns it to its home. And then a whole swarm of them appear, along with a recently-freed and very angry yokai who's hunting a lost ring... and so it goes in the everyday life of Natsume! The ring-hunt turns into a major expedition, with Natsume drafting more of his yokai friends to help, and with increasingly weird things happening as a result. But the friendly fuzzballs turn out to be much more impressive than they appeared at first, for a triumphant resolution. The next arc's darker, with Natsume falling foul of some very creepy yokai, and with the even creepier exorcist Matoba turning up as well. And when Natsume is captured and the Book of Friends taken, things get very suspenseful indeed! 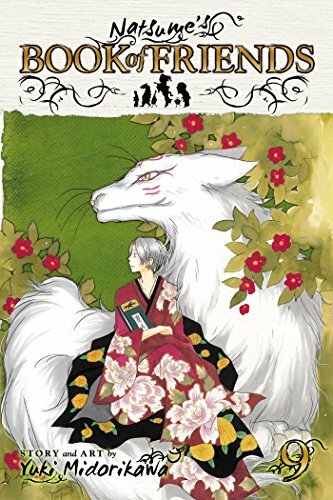 Matoba wants to know more about Natsume and his powers - but, so far, he doesn't know about the book, and Natsume realizes it's vital to keep it that way, as Matoba has no hesitation in tormenting yokai to force them to obey him. Easily the nastiest character in the series, this guy, for all his affable demeanor. After all the tension and drama, it was lovely to see Natsume running to meet his friends, all garbed in yukata for a festival. Lovely artwork! 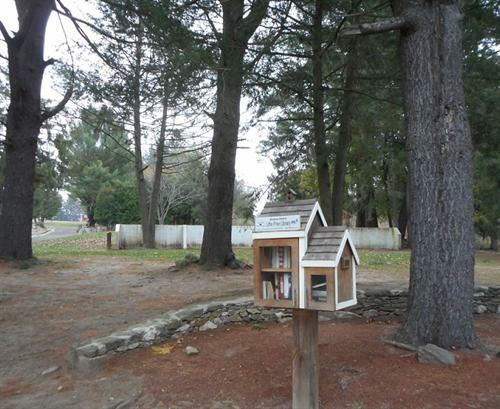 I left this book in the Little Free Library on this chilly, drizzly day. Hope someone enjoys it!